1 More Millennial households are in poverty than households headed by any other generation. 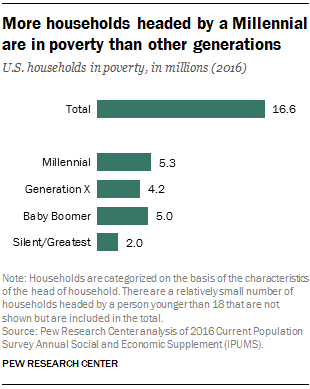 In 2016, an estimated 5.3 million of the nearly 17 million U.S. households living in poverty were headed by a Millennial, compared with 4.2 million headed by a Gen Xer and 5.0 million headed by a Baby Boomer. The relatively high number of Millennial households in poverty partly reflects the fact that the poverty rate among households headed by a young adult has been rising over the past half century while dramatically declining among households headed by those 65 and older. In addition, Millennials are more racially and ethnically diverse than the other adult generations, and a greater share of Millennial households are headed by minorities, who tend to have higher poverty rates. Millennial heads of households are also more likely to be unmarried, which is associated with higher poverty. 2Millennial households dominate the ranks of the nation’s renters. Last year, Millennials headed 18.4 million of the estimated 45.9 million households that rent their home. By comparison, only 12.9 million Generation X and 10.4 million Boomer households were renters. Among households headed by a member of the Silent or Greatest generation, 4.1 million were renters. 3 About half of cohabiting-couple households are headed by a Millennial. 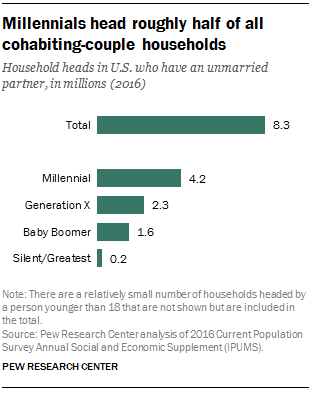 Since 2011, Millennials have headed more households made up of unmarried partners than any other adult generation. By 2016, Millennials were heads of 4.2 million of an estimated 8.3 million cohabiting-couple households. The greater prevalence of cohabitation among Millennial households partly reflects that Millennials are more likely to live with a romantic partner than earlier generations of young adults. For example, in 2012, among women ages 25 to 29 who were living with a spouse or partner, 37% were cohabiting. By comparison, in 1987 – when Boomers were at a comparable age to Millennials – just 10% of 25- to 29-year-old women in a union were cohabiting. 4 In 2016, Millennials for the first time surpassed all other generations in number of household heads who were single mothers. Last year, 8.6 million households were headed by a single mother who lived with a child younger than 18. 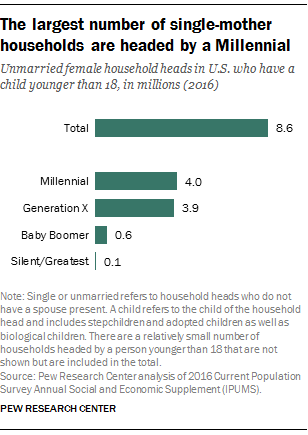 About 4 million of these mothers were Millennials, slightly outnumbering the 3.9 million Gen Xers heading single-mother households. Baby Boomers who were single mothers with young children and heading a household numbered only 0.6 million. The incidence of single parenthood has increased markedly since 1980. That year, 19% of children lived in a single-parent family; by 2014, 34% did. 5Among heads of household, Millennials in 2016 became the generation with the largest number identifying as multiracial. Multiracial Americans are among the nation’s youngest racial and ethnic populations, with a median age of only 19 as of 2015. 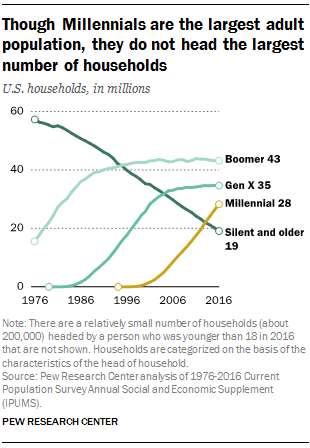 Many of them have yet to form households, but among those who have, Millennials are now the most prevalent. Around 630,000 multiracial Millennials headed a household in 2016, compared with about 540,000 multiracial Gen Xers and a similar number of multiracial Boomers.